Inmode FaceTite provides a significant change in drooping skin from the neck up, which was thought achievable through a facelift. FaceTite is a non-surgical technique that tightens the skin without having scars. You're left with outstanding results without the downtime. The FaceTite™ technique causes the facial skin to tighten up as much as 40% almost immediately. The results are instant with nominal swelling for up to 7-days. In three to six weeks from the date of surgery, brand new collagen develops and creates the look you have always wanted without scars right here in Long Island. The Inmode FaceTite treatment is conducted here within our Long Island office under local anesthesia. We can tighten your jowl line, chin, neck and loose skin areas that you are struggling with. Just before treatment, you will be given an oral sedative to curb your anxiety and numbing cream. We probe the area by making a small incision to heat the tissue area by resulting in much tighter skin. The majority of our patients claim that the treatment is comfortable. Even though you'll be awake during this procedure, you will still need someone to drive you home. Before you leave and for best results, you will be tightly wrapped in a compression garment. FaceTite is a fraction of the time compared to getting a full facelift, with the majority of our Long Island patients needing just a couple days to recover. FaceTite is the suggested treatment for men and women with extra skin who are looking for great results without lengthy recovery and danger of a facelift. Look and feel your best with Inmode FaceTite treatment. 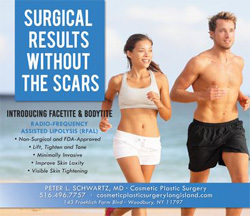 Long Island's Best Choice for Inmode FaceTite Treatment.